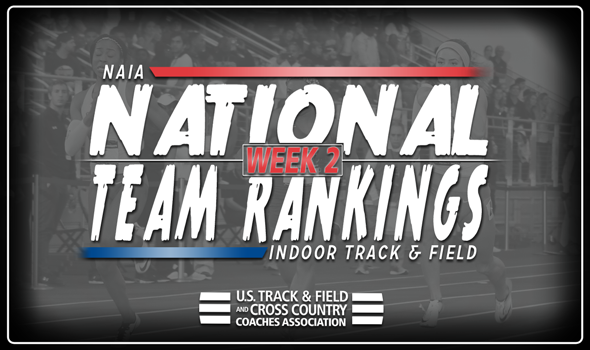 NEW ORLEANS – With just about one month remaining until the 2018 NAIA Indoor Track & Field Championships, changes ripped through the Men’s and Women’s National Team Rankings that were released Wednesday by the U.S. Track & Field and Cross Country Coaches Association (USTFCCCA). The top-2 teams in each index remained the same, but 20 of the other 23 men’s teams swapped spots, as did 22 of the 23 women’s teams in the top-25. Mark your calendars for March 1-3 in Pittsburg, Kansas, because that’s when the best of the best in NAIA Indoor Track & Field will converge on the Robert W. Plaster Center. Indiana Tech and Doane (Neb.) sit first and second for the second week in a row. This is also marks the 17th time in the history of the Men’s National Team Rankings that the Warriors and Tigers have been ranked in that order, respectively. Cornerstone (Mich.) moved up 11 spots from Week 1 to Week 2 thanks to the efforts of its strong distance corps. Colin De Young is going to be a threat for the Golden Eagles in both the 5000 and 3000, where he’s ranked first and second, respectively. Other than De Young, look out for Sam Elmi in the 5000 (fifth) and the second-ranked 4×800 relay. Keiser (Fla.) jumped six spots since the last index, taking up residence in the top-5 at a program-high No. 5. The Seahawks had never been ranked in the top-10 before and will hope Jacob Nkamasiai (first, 3000; second, 5000), Chris Grinley (first, 60 hurdles) and Edens Thermidor (first, 400) continue to excel in 2018. Seven other teams soared three or more spots from Week 1 to Week 2, paced by Cumberlands (Ky.) and Concordia (Neb. ), which vaulted 16 and 14 spots, respectively. Indiana Tech and Friends (Kan.) are still No. 1 and No. 2 in the women’s rankings, but the top-5 looks a bit different around them. For starters, Southern-New Orleans (La.) comes in at No. 3 after being ranked No. 6 last week. The Lady Knights inched their way up the index after Shadae Hylton recorded the nation’s fastest time in the 400. Hylton’s effort now gives SUNO four top-ranked efforts this season (60, 200, 400 and 4×400). Aquinas (Mich.) entered the top-5 for the first time this season at No. 5. Adri Sigafoose is a terror at both the 600 and 800 – where she is ranked first in both – and both of the Saints’ relay teams are ranked in the top-3 nationally. You’ll have to look further down to see the biggest moves of the week: Judson (Ill.) going from No. 55 to No. 22 and Oklahoma City jumping from No. 46 to No. 24.